SUI Sailing Awards 2019: time to vote! 15 participants are nominated in five categories and wait for your vote! On Saturday, 23 February 2019, the best sailors in Switzerland will be honoured at the 6th SUI Sailing Awards in Berne. This month began the final phase with the announcement of the nominations. Two GYC Racing Team members are on the list in the category for Male Sailor of the Year 2017-2018: Mateo Sanz Lanz (Windsurfing) and Nils Theuninck (Finn). Votes from the public will determine the winner of the Public Award. Additionally, 30% of the votes from the public will be considered for the overall results. Votes are open until 31 January 2019 on https://bit.ly/2UfODW6. The GYC Racing Team members Eliot Merceron, Mateo Sanz Lanz and Nils Theuninck successfully concluded their racing season 2018 with the Olympic week in Enoshima in September 2018. During three weeks the athletes had the possibility to race in the waters of the Olympic Games. The regattas in Enoshima kicked off with the World Cup, where Mateo Sanz Lanz won silver in the RS:X windsurf class. With multiple top ten rankings, the other GYC Racing Team athletes also achieved promising results. 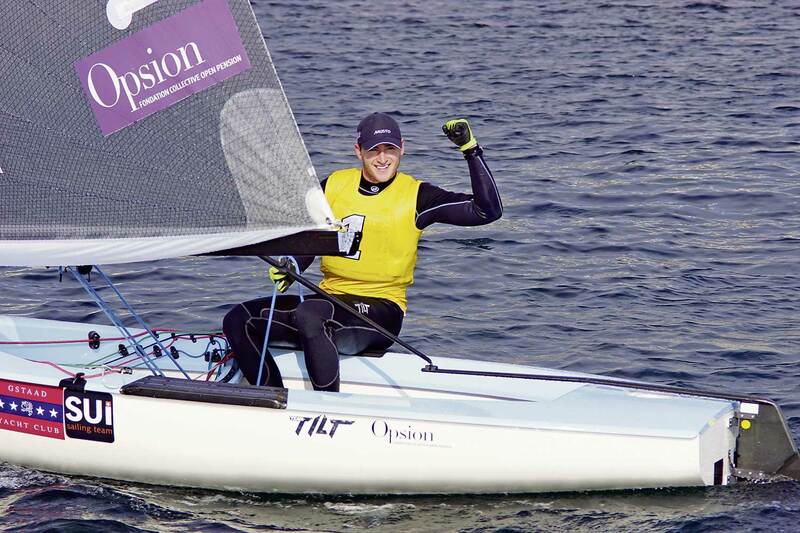 Laser Standard sailor Eliot Merceron finished 24th in a fleet of 59 participants. Nils Theuninck qualified for the Medal Race. After a break of five days the races for the Olympic week started and all the GYC Racing Team athletes managed to finish the competition in the top ten. Eliot Merceron finished in 8th position, Nils Theuninck in 6th and Mateo Sanz Lanz made it all the way up and took the victory at the final competition before the winter break. With the success over the complete competition and the victory in the Medal Race, Nils Theuninck became well-deserved Swiss Champion in the Finn class with an amazing lead of 24 points. The competition took place in the middle of November. In a close fight for the silver medal, Christoph Burger moved up to 2nd place and Jürgen Eiermann followed in 3rd position. After the great result at the World Cup in Enoshima, this title is proof of Theuninck’s great talent and gives hope for more successes in the future. The sailing season 2018 was packed with many hours of hard work on the water for trainings and regattas. The sailors now enjoy a period of rest and recuperation before heading to Miami for the next round of the World Cup Series in February 2019.